Pocket queries (PQ) deleted from the "Ready to download..." tab on the website still show up in the app as permanent/undeletable lists. In the app, the (...) menu doesn't display a "Deleted this list" option as with regular lists. I've deleted 100% of my pocket queries. Logged out of the app. Deleted the app cache. The last PQ I've generated last week and deleted since reappears as soon as a log back in the app. Regular lists can be deleted and behave as expected. How did you manage to delete "100%" of your Pocket Queries? I hadn't tried deleting one right after running it on the web site, so I tried that just now. 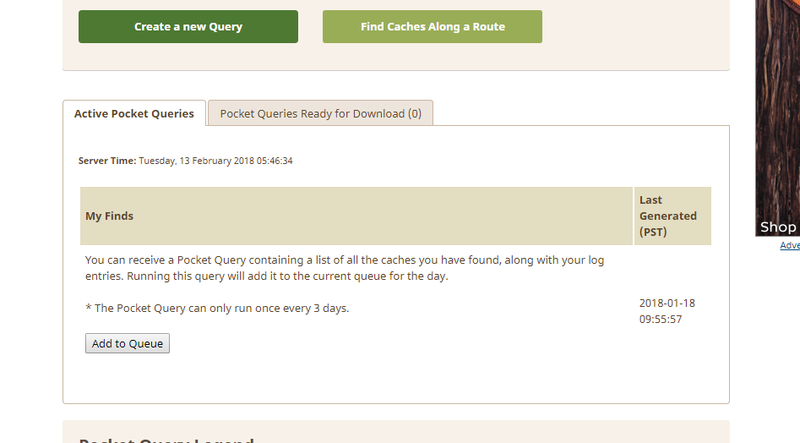 But deleting the "Active Pocket Query" does not immediately remove it. The PQ name is lined-out, which I guess means it is to disappear with its download, in 6 days. I removed the download, but the "Active Pocket Query" remains. And it's still there in the App available for download. For, I think, the same 6 days. I'll report back at that time, if it seems to be "permanent". The Pocket Query doesn't have a "delete" option because it vanishes from the App automatically along with the expiration of the "Pocket Queries Ready For Download". They hang around for 6 days, and even longer if you run them on a schedule. I didn't know that deleting the downloadable PQ doesn't make the "download" disappear. But I ran it because I wanted to have it, so it makes sense that I can download it in the App during the download's entire lifetime. That's a pretty good deal, because you should get 6 days, and you do. If you were able to delete it from the App within those 6 days, how would you un-delete it if you change your mind? That is, there would be new issues of lost PQs that were still valid, and having to run new PQs when there is a limit to the number that can be run. Do you mean that a PQ you ran more than 6 days ago remains available for download in the App? I haven't gotten that to happen. Mine go away automatically. So if it is an issue with the App, it's likely got something to do with early manual deletion from the web site. How soon after you run (and download to the App) do you delete everything from the web site? Are you still seeing undeleteable Pocket Queries within the App, more than a week later? Is this something new? That is, previously it worked the way you like and lately it's broken? I see a download available in the App for the usual 6 days regardless of what I "delete" from the site, and I guess that's by design. There's no "delete" in the App because PQs go away by themselves. I wonder it the programmers didn't expect people to manually delete it all, upon download. My practice, if I were to do something like this is to use the automatic features of the web site and App, and allow all of these the items to vanish on their own schedule. It's at least twice the work to clean it up immediately, manually. OK, you can. But maybe they didn't think anybody would. I'm testing a couple of things now, and the web site behaves somewhat differently than I'd expect. But I won't have all the results until 7 days from now, to see what happens in the App. If it's still an issue, phone and firmware and App version info may be useful. I'm still testing this, but the early results seem to show that something's fishy with both the App and the Geocaching.com site. Pocket Queries are sticking around when they should be gone. As a test, on February 13, 2018 I made and ran two PQs once only, “Test1” and “Test 2”. I downloaded both PQs "offline" to the App as they became available. I then deleted the “Test 2” download file from the website along with its active Pocket Query. I left “Test1” in place and allowed its download the time to automatically to vanish (which has not occurred). As of February 21, 2018, both PQs remain displayed in the App. Since February 13th, I haven't tried to “download offline data” on these PQs, but if there continues to be dead silence from TPTB on this issue , I'll forge ahead and post further test results when I have time. Recurring PQs are working just fine, but of course are not expected to disappear. “Test1” should have disappeared from the site automatically, a couple of days ago. But remains on its “last day”. 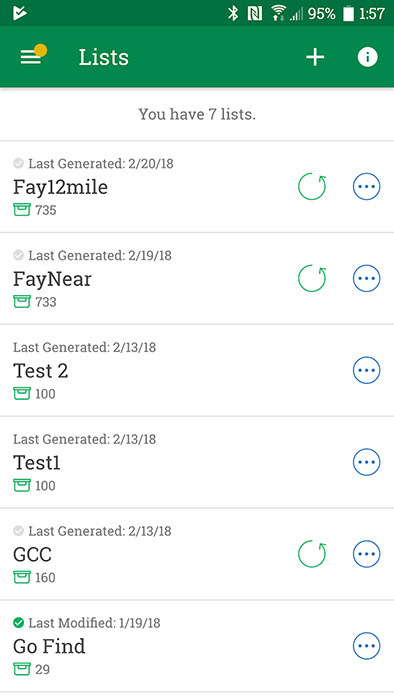 “Test 1” and “Test 2” should be gone from the App by now, but remain listed there. I haven't tried anything that might get rid of these ghosts (phone reset, or whatever). As mentioned, there is no App "delete" button for unwanted Pocket Queries, so it's essential that the App never leaves ghosts. At least have a "refresh" button. "Reset Phone" is not what I have in mind to manage App features. I'll try other things in a couple more days, when I can clearly show it's not just a time zone thing, that these are indeed overdue. I got the new App Version 5.10.1 tonight on my HTC U11 phone. This changed nothing, but once the items are cleared, who knows. Maybe the new version prevents this Topic's bugs. If so, that info would be useful in a reply to this thread. At 10:57AM on Feb 22, 2018, all ghost PQs have cleared. It took 9 days for the PQs to automatically vanish from the web site and/or App.